JAKARTA, Indonesia—On February 11, 2018, KH. 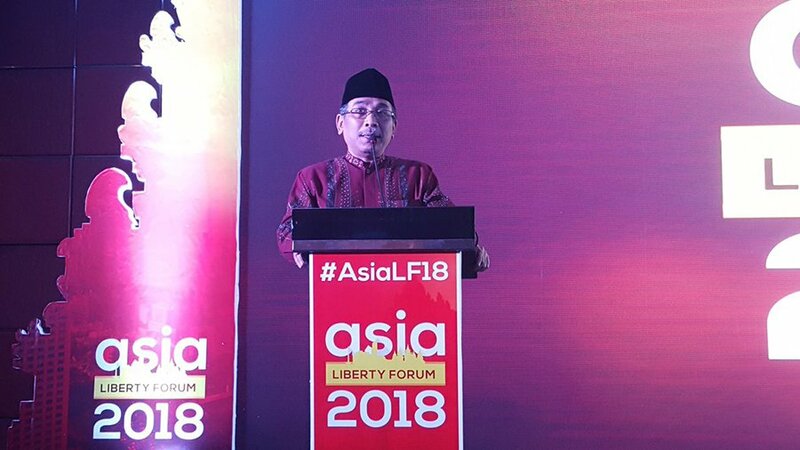 Yahya Cholil Staquf—General Secretary of the world’s largest Muslim organization—received a standing ovation after delivering a keynote address to representatives of think tanks from over 20 nations throughout the Asia Pacific region, who gathered in Jakarta for the 2018 Asia Liberty Forum, co-hosted by the Center for Indonesian Policy Studies and the Atlas Network. The Nahdlatul Ulama General Secretary outlined his vision for establishing a common platform—inspired by the universal, humanitarian principles embedded within the preamble to Indonesia’s 1945 Constitution—to manage ideological, religious, ethnic, cultural and political differences that jeopardize international peace and security, and threaten to rip asunder the very fabric of modern civilization. The General Secretary described why Indonesia’s founders established their new nation as a Pancasila (multi-religious and pluralistic) state—which guaranteed equal rights to all its citizens—and called upon the world’s opinion leaders to “embrace the vision of a noble civilization, and nobility of character, as something that can unite all of us on the basis of our shared humanity.” The full text of Kyai Haji Yahya Cholil Staquf’s keynote address, as revised and edited for publication, may be read below. May God’s infinite peace, blessings and compassion envelope each and every one of you. Alhamdulillaah was shukru lillaah was salaatu was salaamu ‘alaa rasuulillaah Sayyidninaa wa mawlaanaa Muhammad ibni ‘Abdillaah wa ‘alaa aalihi wa sahbihi wa man waalaah. Praise and thanks be to God, and may the Lord shower His peace, blessings and eternal salvation upon the noble Messenger of God—our spiritual guide Muhammad, the son of Abdullah—and upon all his blessed family and companions. May His grace envelope each of you, both during and after this event. I feel so honored to be given this precious opportunity to address you, precious people, at this precious event. So thank you, Mr. Rainer Heufers, for inviting me. This was simply too precious an opportunity for me to miss, although I just arrived back this afternoon from two weeks travel in the United States. Last Thursday morning, in Washington DC, I participated in an event called the National Prayer Breakfast. It’s an American tradition, which has been held annually for at least 65 years. Our American friends here surely know what it is. Non-Americans can simply Google it to understand. A huge crowd of people ate breakfast together and President Trump delivered a speech. Thoughtfully, they let us eat before the President’s speech. I guess they may have wanted to ensure there was nothing to spoil anyone’s appetite. So I’m relieved that I was asked to speak after your meal tonight. That way I’m sure not to spoil anyone’s appetite here, either. Ladies and gentlemen, you just saw our Acehnese sisters’ perform their traditional dance. You saw how they dressed, how they moved, their energy and spirit…. That is the true Aceh! The Aceh we love! The Aceh that helps to shape Nusantara (East Indies) civilization! Serving in the leadership of the Nahdlatul Ulama, I am naturally active dealing with the issues of extremism and terror. It happens that not long ago I met representatives from a government agency within a certain country, who invited me to join their de-radicalization projects. I declined their offer. I said: “Our attitude—I’m speaking about the Nahdlatul Ulama’s attitude—in addressing the threat of terrorism, is not to focus primarily upon the de-radicalization of people, one by one. Rather than limit our focus to individual grains of sand upon a beach—questioning why they behave as they do—we seek to shape the tidal forces and other elements responsible for the deposition and alignment of the beach itself. We do that by reinforcing a civilizational worldview that marginalizes and discredits extremist ideology, while isolating the radicals themselves. I expressed this view to a friend who heads a large think tank in Europe. He immediately grasped the idea, but then responded: “Is Western civilization worth defending?” Many of you may have different opinions about this matter. But the point is: my friend is acutely aware of problems within European civilization, and not merely those within Islam. I have long maintained that we face a threat from Islamist radicalism and extremism. I repeat: Islamist radicalism and extremism. Some of you may think that I sound like Donald Trump. But you should know: I’ve been discussing this problem for decades – long before Trump ran for President. It’s simply that I do not Tweet about it. We’re facing a threat to the very foundations of civilization itself. You see, we have inherited many centuries of problematic history. When people discuss Islamophobia, for example, they often view it as a response to current Islamist radicalism and extremism. I say no. Its origins are much deeper than that. For five centuries the Ottoman Empire was engaged in constant military conflict with neighboring European states, from the Balkans, Austria, Hungry and Poland to Italy and Spain. Can anyone reasonably expect that this would not have affected the mindset of Europeans, over a period of countless generations? The same dynamic applies to the Islamic world, particularly in the Middle East and North Africa. After centuries of enmity towards the kuffar (infidels), it is understandable that the idea of enmity towards non-Muslims became established within classical Islamic orthodoxy—which, to this day, remains the most authoritative standard of religious guidance for most Muslims worldwide. Given this history, perhaps none of us should be surprised that we now face a profound threat to modern civilization. We live in a highly diverse world, with so many kinds of diversity: ethnic, cultural, religious; economic and political interests; and so forth. We desperately need to establish a common platform to accommodate and manage all these diverse elements, in a way that prevents conflict and violence. There is a room in that building where—if you had entered it more than 70 years ago and looked around—you would have seen the dynamics of the entire world at play. That room was full of individuals who embraced all kinds of ideologies and views regarding the future of human civilization. These ranged from Western liberalism to Javanese integralism. From Islamism to Communism. So, the people in that room—Indonesia’s founding fathers—had to find a way to manage their differences, to prevent conflict and violence. That is why—when developing the foundational concept for the Indonesian nation state—the vision they articulated was not limited to Indonesia’s independence: i.e., our right to freedom from colonial occupation and repression. Since our declaration of Independence in 1945, this vision has been the strongest single factor holding Indonesia, and Indonesians, together. Since Independence we have faced countless problems, yet we have prevailed because we have something to unite us and hold on to together—this vision of a noble civilization. Given the current state of the world, why don’t we—who come from so many different nations, cultures and ethnicities—do the same? Amidst so much diversity, why don’t we embrace the vision of a noble civilization, and nobility of character, as something that can unite all of us on the basis of our shared humanity? I believe this will not be difficult. Nobility is a simple concept, which all decent people understand. Only cruel and malicious people fail to understand the nature of human nobility. Nobility is intimately linked to freedom, dignity, compassion and justice. We all know this! So, when we speak about economics, for example, why don’t we think about a “noble economy?” When we discuss politics, why don’t we think in terms of a “noble politics”? And so forth. As I believe that respecting the freedom and dignity of others is essential to, and the very foundation of, nobility, I truly hope that this forum of yours will provide a vital contribution to a more noble civilization, for the benefit of all humanity. Download a four-page PDF copy of this communiqué (with image).